The Capital One Venture carries a $95 annual fee (waived the first year), but you can instantly offset that by taking advantage of generous travel fee credits, which bring up to $100 in value and offset the cost of either Global Entry or TSA Pre✓® enrollment. Since it’s the giving season, it’s good to know that even if you already have a TSA Pre or Global Entry membership of your own, then you can gift the fee credit to someone else. This could be brilliant if you have a work colleague or family member who always slows you down at the airport! Happy New Year, indeed! The more miles you earn the easier it is to fly further (or fancier). Aside from TSA Pre✓® fee credits, Capital One Venture created new benefit in 2018, which make your Venture Miles even more valuable than ever, by including airline miles transfers and also a cool partnership with Hotels.com. When you book hotel stays via Hotels.com/Venture and pay with your Capital One Venture Card through January 2020, you earn 10x Venture miles, which equals up to 7.5 airline miles per dollar spent from most of their transfer partners. Yep, up to 7.5 airline miles per dollar spent – that’s outstanding. This is an incredible way to rack up miles from your hotel stays, while scoring great rates. If you combine this generous offer with the Hotels.com loyalty program, you can do seriously well. You still earn rewards from Hotels.com via their own loyalty program, where you get a free night – minus taxes and fees – for every 10 total nights you stay. It has a nice ring to it, doesn’t it? Unlike some cards, which only reward certain purchases, Capital One Venture offers 2x Venture miles, equal to up to 1.5 airline miles, per dollar spent. Earning more than one airline mile for everything, not just some things you buy, makes this a fantastic opportunity to turn your personal finances into major travel wins. When you redeem Venture miles via Capital One, you can use your miles towards any travel expense, within 90 days of purchase via “purchase eraser”. There’s no “better” or “worse” way to use your miles when you redeem in this style, because you’re getting a fixed value. When used in this way, each Venture mile is worth 1 cent, so 100,000 Venture Miles would cover $1,000 worth of travel. You can take some money off a cheap flight or erase a hotel purchase by using Venture miles to cover some or all of the cost. No need for a PhD in points! When this is great: This is a really valuable option for those who find great airfare deals, dreamy mistake fares and want to earn airline miles from their tickets. It’s also great for those who don’t have the flexibility to travel when awards seats are available with airline miles. For example, school holidays can be near impossible using airline miles, so this presents a great extra option to travel more flexibly. This can also be great for travel purchases you may not always think of using points for, like cruises or rental cars! 100,000 airline miles round trip USA to Japan in business class via transfer partner Etihad Airways for flights on American Airlines. 80,000 airline miles round trip USA to Australia in economy via transfer partner Avianca for flights on many Star Alliance airlines. 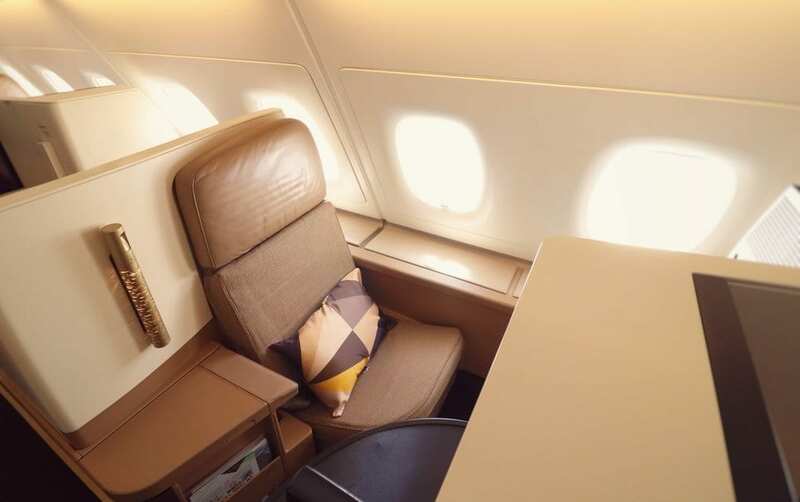 165,000 airline miles for an *almost* around the world trip in business class via transfer partner Asia Miles for flights on many OneWorld airlines like Cathay Pacific, JAL. 26,000 airline miles for one way business class from the USA to Europe in business class during “promo awards” on transfer partner Air France “FlyingBlue” on Delta, Air France. When this is great: If you have aspirational travel goals and flexibility, this is a wonderful way to redeem miles for experiences which can be out-of-sight expensive paying cash. You’ll need to learn how to search for available seats, but Capital One’s airline transfer partners offer lots of great options. Check out this card offer here. The redemption rates and travel rewards programs described above are current as of December 2018 and may change. It’s always best to review the most current information directly on the loyalty program’s site.